Stocks fell sharply on Friday, adding to their steep weekly losses, as investors assessed the possibility of a trade war brewing between the U.S. and China. The Dow Jones industrial average dropped 424.69 points to close at 23,533.20 — its lowest level since November — with DowDuPont as the worst-performing stock. The 30-stock index also closed in correction, down 11.6 percent from its 52-week high. The S&P 500 declined 2.1 percent to 2,588.26, with financials pulling back 3 percent. It also closed just outside correction territory. 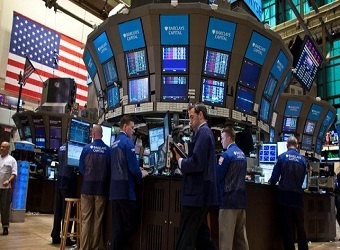 The Nasdaq composite fell 2.4 percent to 6,992.67. The indexes, along with the Dow, had traded higher earlier in the session. “People are a little worried ahead of the weekend. You can see that people have been buying a little bit of the options that expire next week which would give you a little protection over the weekend,” said Patrick Kernan of Cardinal Capital. Kernan, who trades in the pit at the Cboe, said the sell off this week has been a lot more orderly than February’s decline. “There’s not lots of panic,” he said. Week to date, the major averages posted their worst week since January 2016. The Dow and S&P 500 dropped 5.7 percent and 5.9 percent, respectively, while the Nasdaq pulled back 6.5 percent. The week also ended with eight of 11 S&P 500 sectors in correction. “We think the outlook on stocks is pretty balanced,” said Eric Freedman, chief investment officer at U.S. Bank Wealth Management. “While we think corporate earnings are intact, the market is going to have to digest some pretty meaty events like the midterm election as well as all the trade policy news.” President Donald Trump pressed ahead with long-promised anti-China charges on Thursday. The U.S. president signed an executive memorandum that will impose tariffs on up to $60 billion in Chinese imports. In response, China’s commerce ministry proposed a list of 128 U.S. products as potential retaliation targets, according to a statement on its website posted Friday morning. Beijing’s ministry said it will take measures against the 128 U.S. goods in two stages if it cannot reach an agreement with Washington, adding that it could also take legal action under World Trade Organization rules. China’s announcement sent stock futures lower overnight before they recovered. The news also comes after Dow lost more than 700 points in the previous session, while the S&P 500 and Nasdaq declined more than 2 percent. Tech has also put the broader market under pressure this week as shares of Facebook dropped 13.8 percent in that time period. Facebook dropped sharply this week on news that Cambridge Analytica gathered data from 50 million Facebook profiles without the permission of its users. On Friday, the stock fell 3.3 percent. Bank stocks have also been under pressure. The SPDR S&P Bank ETF (KBE) fell 3.4 percent Friday and was headed for a weekly decline of 7.6 percent. Bank of America pulled back 4.5 percent. Stocks briefly bounded earlier on Friday after Trump said he signed the $1.3 trillion omnibus spending bill into law Friday, despite threatening to veto the legislation earlier in the day. Trump signed the bill, but made his distaste for the rushed process known. In corporate news, shares of Dow-component Nike rose slightly after the apparel company reported better-than-expected earnings. Nike got a boost from sales in Greater China, which rose 24 percent during the third quarter.